A thread may be thin and weak itself, and is usually invisible when sewn, or rather, should not be visible at all. However, it has an important role to bind things together. When we look at, for example, a beautiful dress, we tend to see things which stand out, such as gorgeous material, or bright colour or pattern. But even if you cannot see, threads are there to connect parts. Without them, everything will fall apart. Regardless of the size, the color, or the texture, threads can stitch those flat parts to a sterical and beautiful shape. However weak it may be in itself, a thread can affect the outcome of whole dressmaking. However thin it may be, it can hold things firmly. However invisible it may be, it can function as a core. Human beings are weak and cannot live alone. We are connected in society, and get along by helping and cooperating with each other. Individual characteristics, values, or philosophy may be varied, but there must be something between us, which keeps us together like a thread. It would not be physically visible, but rather moral like trust and respect. When we relate our diverse individuality and work together, we can accomplish great achievements which are impossible single-handed. The same could be said in couple dancing! 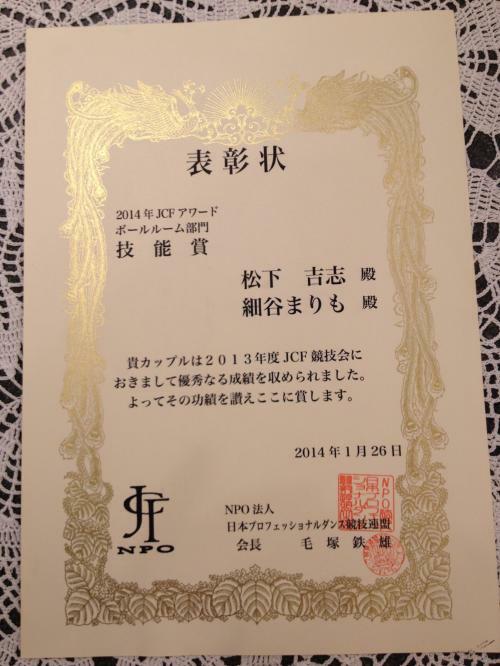 Yoshi and I Got "JCF Technical Award 2014"
It was a totally unexpected and extremely happy surprise. I did not even know the existence of the "Award" itself. We entered a lot of competitions last year and just feverishly danced each time. Freshly started as a couple, we just tried not to fall apart while dancing. We had been extremely lucky and won some competitions. I am totally delighted receiving the "Award." 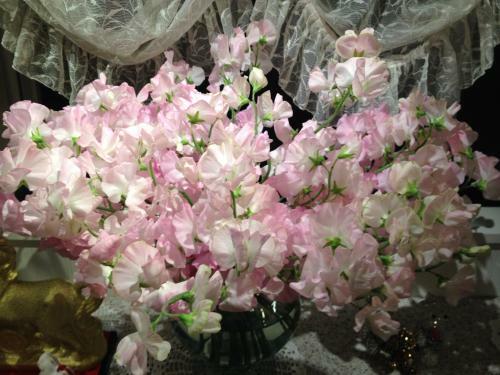 From this year, we will try our best to improve the quality and the hermony between us. 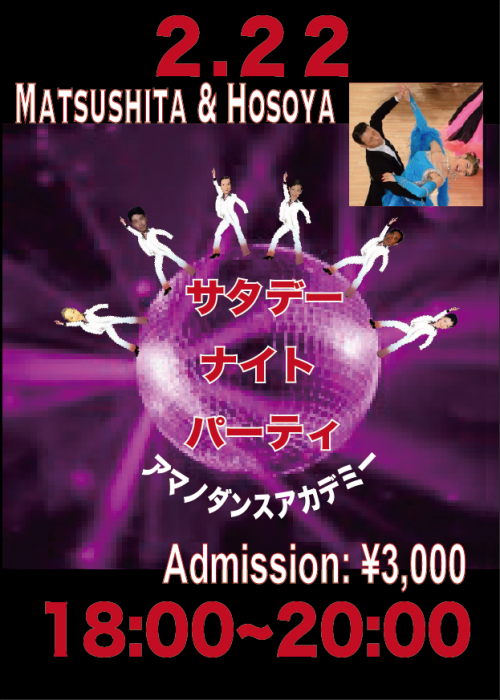 We hope to dance well on Sunday at the Kanagawa Ballroom Championship. The Takahashi family, who appeared with Hiro on the TV program "OUCHI Surprise" last Saturday, sent a panel of pictures together with a kind thank-you letter. The panel is made of various pictures they took during the TV filming, and the pictures are beautifully arranged with captions. Gramma Noriko was so thrilled and happy meeting Hiro, and we received such a charming present. It was really a Happy Surprise! The panel is displayed in the ADA studio, so please come and have a look to share the joy. Yoshi and I will dance for the professional show. Looking forward to welconing you! 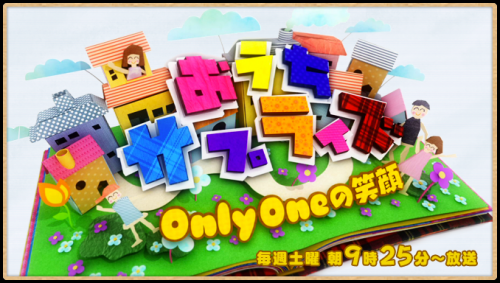 Nippon Television Schedule has changed, and the ADA studio appearance is now postponed to 25 February. So, please note that there is no studio appearance tomorrow. The first competition we enter this year will be in Yokohama this weekend. Sunday 2 February "Kanagawa Ballroom Championship"
Landmark Hall is located on the 5th Floor, Landmark Plaza, near JR "Sakuragicho" Station or Subway "Minatomirai" Station. The Professional Championship will start in the late afternoon. Please contact the studio staff for advance tickets. Sunday 2 March "East Japan Ballroom Championship (Central League)"
Sunday 16 March "Universal Grand Prix Ballroom Championship"
We will try our best as A class dancers. Have you seen the program this morning? For gramma Noriko, Hiro was an icon she'd been longing for. Her emotional reaction when she saw Hiro was touching and moving. It was a lovely happy surprise! If you missed the program, you can watch it with the address below. It is a warm day today. The weather forecast says it will be even warmer tomorrow. This weekend will be mild and peaceful. Hiro's TV appearance is just a day away. Do not miss Tomorrow, from 9:25 to 9:30am at Nippon Television (Channel 4 in Tokyo). 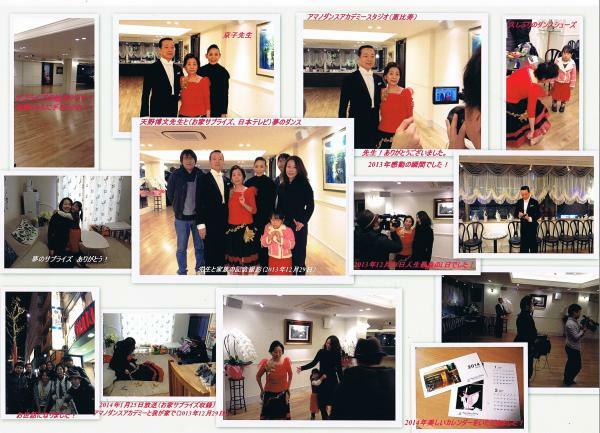 Due to some technical problems, Amano Dance Academy Home Page had not been updated for a while. 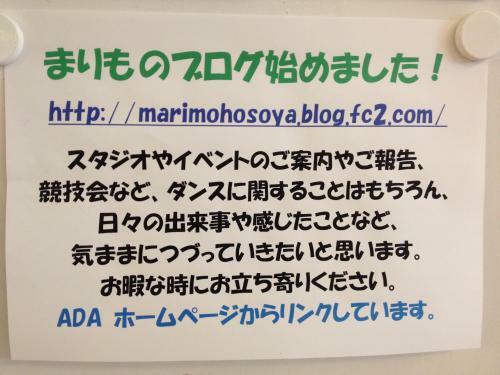 The problems solved, "Marimo's Blog" is now linked from the HP. This blog had been wondering alone, but found its home at last. Please click まりものブログ under the 'Link' category in the Top Page Index. We will update the home page step by step from now on. 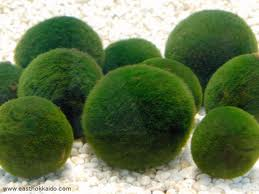 Please visit our home page as well as "Marimo's Blog" to check the latest news. Note the airdate has changed!! 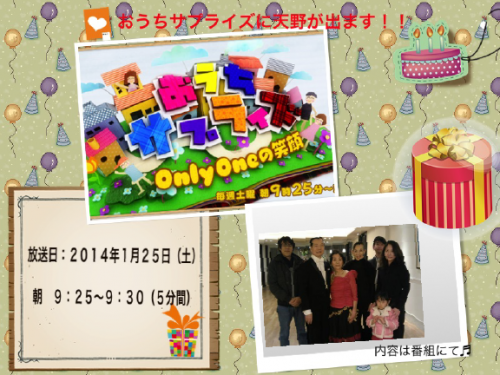 As I wrote before, Hiro will appear on TV on Saturday 25 January. In February in a different program, ADA studio will be televised. There will be no staff appearing on the TV, but you can see our studio through the TV camera. The program is a kind of quiz. A star talent spends a day with a small camera on her/his forehead. Watching the image through the camera, the audience will guess who the star is. Let's watch the TV and see who it is! 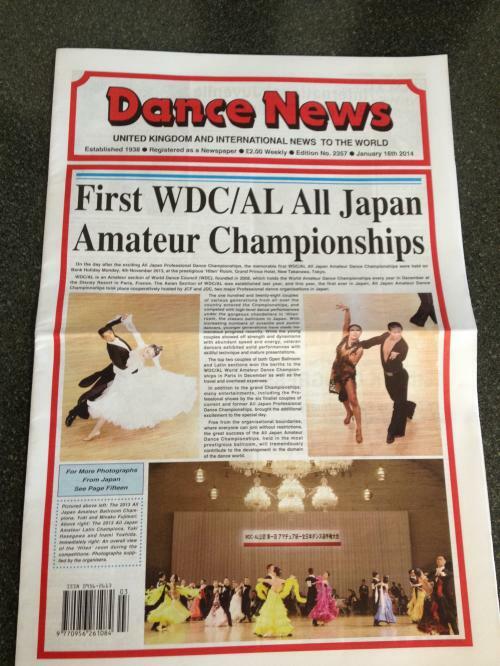 On the front page of the newest edition (16 January) of 'Dance News,' you can read a report from the first "All Japan Amateur Dance Championships," held at the prestigious "Hiten", Grand Prince New Takanawa, last year. The Championships were organized by JCF and JDC, the two major professional dance organizations in Japan. The championships were officially approved by WDC/AL, the most authoritative dance organization in the world, and were the landmark events, which everybody could enter free from the organizational boundaries. 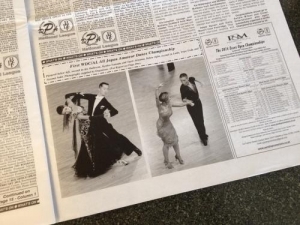 The top two couples of both Open Ballroom and Open Latin sections won the berths to the WDC/AL World Amateur Dance Championships in Paris. The Chamionships will be held on Sunday 2 November this year. We are looking forward to your entries and admissions.